It sounds cliche to say, but clearly it was another wild week on Wall Street. The sharp volatility continued for a second straight week with major averages trading triple-point gains and losses several times throughout the entire week. 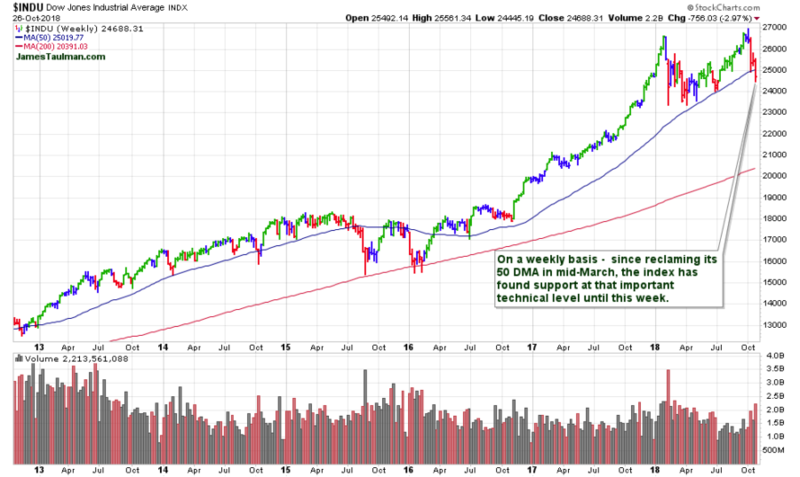 After a quieter day on Monday, the indexes rebounded impressively Tuesday afternoon from a sharp gap down and sell off. It was technically promising to see the Nasdaq bullishly erase most of a loss which at one point exceeded -2%. However, there was no continued momentum the following day, ending hopes that the positive reversal would extend a market rebound. Instead, on Wednesday the Nasdaq and S&P 500 actually went on to convincingly undercut Tuesday’s mid-day lows with the Nasdaq plummeting more than -4% that session. This also, of course, deepened the correction. We closed out the week with the indices making new lows not seen since early July, and with the S&P 500 and the Dow in the red for 2018. The Nasdaq remains up +3.8% year-to-date although the tech-heavy benchmark entered correction territory on Wednesday, when it closed more than -10% below its recent highs. For the week, the Dow closed off -3%, while the S&P 500 lost another -3.9% and the Nasdaq dropped -3.8%. With October coming to a close, the S&P has lost -8.8%, the Dow is down -6.7%, and the Nasdaq has shed -11% so far this month. Its been a brutal month which has erased about $5 trillion in value from global stock and bond markets. We did see GDP grow +3.5% in the third quarter, after +4.2% in the second quarter. Data showed that consumer spending rose in the latest quarter but was offset by a slowdown in business and residential investment. We are in the midst of another earnings season. Data as of Tuesday’s close – the 140 companies in the S&P 500 that have reported third-quarter results this year, 81% posted earnings per share that were above Wall Street expectations. For the current market – by the book, a follow-through day is still possible in the near-term. That would traditionally serve to confirm a new uptrend. Keep in mind that a lot of broad technical damage has been done in the past several weeks. That will likely take more time to repair. Also, all of our recent breakouts have basically failed. It would be nice to see at least a few of them workout, before doing any new buying. It’s also earnings season, and we do not want to be buying stocks just ahead of their company announcements. And of course, we have the 2018 mid-term election results upcoming which are likely to serve as a catalyst to the markets in one direction or another.